The field data collection software Allure provides solutions for projects, companies, authorithies and organisations who want to collect and combine data electronically using mobile devices in harsh conditions and with several persons in the field. The data collection forms are customised to each customer’s specific needs. Its easy-to-use web-based forms can be used on any mobile device (computers, tablets or smartphones) also without internet connection. Data collected with Allure is sent to a server, where the information automatically is collected, in line with the customer’s specifications (cloud-based or local server). The data from multiple users is automatically combined into one dataset for the project manager to use. The collected information is safely stored on a server, even if something would happen to the mobile device the data is collected on. The data collection form can include both numerical, photographical, as well as text data. It also includes customized data collection fields, such as GPS-based location, maps, as well as sliders to determine for example surface coverage. 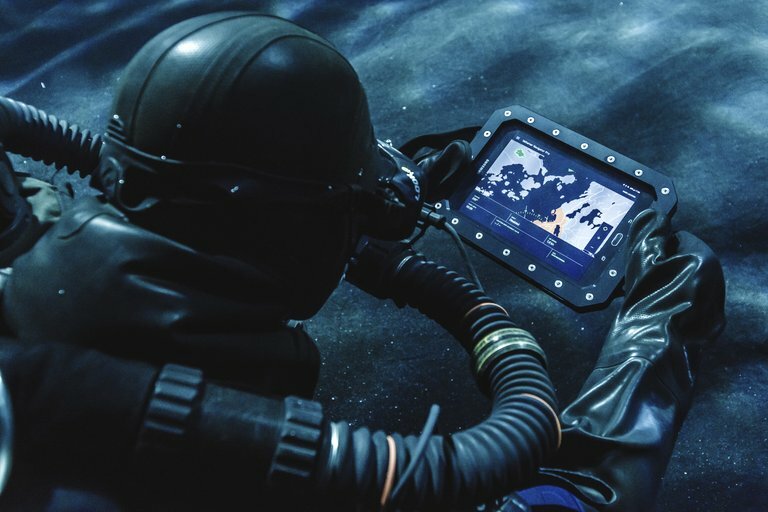 Specifically designed for special forces operations where exact navigation capabilities are a must – useful also for other types of divers. The Navigator software is a navigational aid that can be used either online or offline. When online, the software shows your exact GPS location on the map, while it works using dead reckoning when offline. For online underwater navigation, please read more about our Allhub Internet & GPS system. Please note! You must read the software’s quick start guide before using it. The software is not a substitute for proper navigational equipment, dive computer or back-up instrumentation.